The Bronze Age marks a significant stage in the development of modern humans; not only was some of the most interesting early sculpture flourishing within civilisations (the Shang Dynasty, the New Kingdom of Egypt and the Akkadian Empire spring to mind) but it was also the start of a material change to manufacturing. Unlike silver, copper or gold, bronze-making requires a complicated, multi-step process: tin must first be mined, smelted, and then mixed with molten copper (which was often sourced through trade routes) in the correct proportions to produce a bronze alloy. Over time, other metals have been added to produce bronzes with different qualities or properties – arsenic, iron, zinc, lead, nickel, aluminium, antimony, manganese and even, in the case of the Gloucester Candlestick, silver. Indeed, some of my favourite objects are bronze: the Benin “bronzes” and “bronze” heads from Ife, a collection of bronze, brass, ivory, wood and ceramics that (even now) still continue to amaze**. They were cast using the lost-wax method, an old, labour-intensive and ultimately destructive process that involves first sculpting the shape in a burnable, malleable substance such as wax, coating in clay or mud, heating to produce a hollow mould and then casting the bronze itself. Bronze has been used in everything from coins, to dental fillings, and from religious artefacts to marine propellor assemblies. Increasingly, it’s also being used for watch cases. I’m rarely lent watches to review for this ‘blog – in fact, it’s happened just twice: once a couple of years ago when I was asked to “test” the accuracy of a new movement that was being built in the UK; and last month, when Pinion Watches lent me one of their Axis Dusk pieces to review. I’ve known Pinion’s owner, Piers Berry, since 2009 or so; he, along with Simon Cudd, started an incredibly successful fan forum for Bell & Ross, and then went on to do the same with Bremont’s Alt1tude Forum. In the spirit of full disclosure, Piers also offered to host this ‘bog while I moved away from Google’s Blogger and on to my own ‘site – a task I’ve not yet completed – so I guess you could say he’s my landlord too. 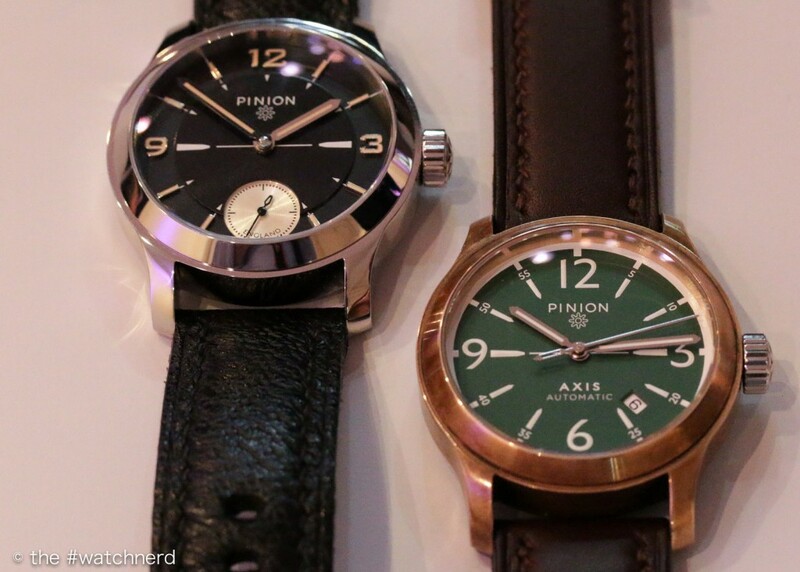 The first Pinion “Axis” watches were unveiled on the opening night of SalonQP 2013 – something I missed, due to a slightly over-zealous doorman. I was quite taken with them at the time – bold, nicely designed, fun – but it took me another twelve months to get my hands on one (I was meant to get it after Hodinkee reviewed the watch over the summer). The Dusk I’ve been wearing is relatively new, and I’ve been interested to learn more about the natural patination of these bronze watches. Bronze is, as you already know, an alloy of copper, zinc, tin and other metals. Given the close proximity to the Holiday Season, I’ve not been able to ascertain the composition of the “marine bronze” used by Pinion. The trend seems to be towards aluminium bronzes, most commonly used in a marine environment. They are tough, fairly tarnish- and corrosion-resistant and less prone to reacting with sulphur compounds. I’ve seen some slightly odd instances of over-patination, so was keen to see what a more natural treatment might do the case. The version I’ve been lent is called the Dusk: a tobacco brown dialled, ETA 2824-2-powered automatic. The Henley-based newcomers, although Swiss-made, watches are sturdy, a decent size (42mm) and not for the faint-of-wrist (c13.5mm high with purposeful 22mm lugs). The case is simple – a classically proportioned design that does away with extraneous details and lets the shape (and the material) shine – and is offset by a moulded steel crown. It’s a very tactile piece, a quality I actively seek out in a watch. The caseback is laser-etched with the logo of The Motion Works, the swiss atelier where the Pinion watches are assembled. For all these reasons the Revival’s form follows its function, and that for me is what makes this a thoroughly modern watch – with heritage at its heart. You can see its modernity and ‘feel’ its history… the ticka-ticka sound from the handwound Valjoux movement is wonderfully satisfying and just a bit different from higher beat modern automatic movements. I can see his point; a manual chrono does have a different “feel” to it, although I’m not sure that it’s just down to the slower vibration rate. The act of winding certainly connects you to the watch in a way many modern automatics can’t, and there is something to that daily ritual. The Revival is certainly interesting, with its slight mushroom pushers, highly polished case and multi-layered dial, a dial which shares certain similarities with the other model that Pinion launched at SalonQP 2014, the Axis Pure. If there’s one thing that links all three watches discussed above, it’s their design. Look beyond the 3-6-9-12 of the Axis ,and you’ll see the bullet-shaped markers repeated in the Pure and Revival. That marker is repeated on the counter-weight to the seconds hands on both the Axis and the Pure, as well as the sub-registers of the Revival. There are multiple similarities across all three models – a cohesive design language that seems to define the Pinion brand. 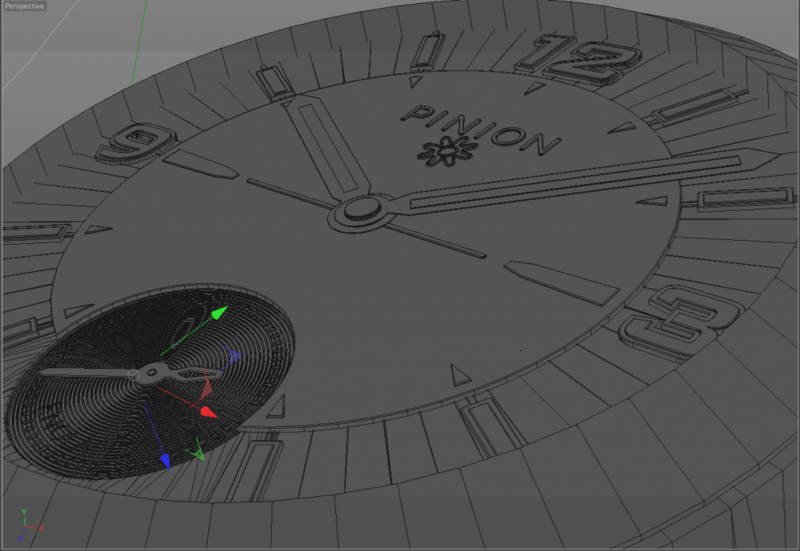 I must admit that I’m glad that they’ve dropped the heavy white ring that surrounds the dial on the Axis; ironically, it seems to make it look smaller, particularly in the dark, where it’s more obvious that the well-lumed markers are positioned away from the bezel. I’ve been wearing the Axis Dusk for six weeks now, watching it for signs of patination, but, perhaps, it’s like the proverbial watched kettle. I’ve not noticed much of a difference, to be honest, although there may be some darkening since I was first given the watch. I like the warmth of the case; as I’ve said before, it’s a remarkably tactile material and I do find myself absentmindedly polishing it with thumb when I’m distracted. The dial on the later models is more interesting, and although the brown tone is attractive, in bright light it could benefit from slightly darker shade. The Dusk wears well, looks great, is reasonably priced (£2,350) and I’ll be very sorry to give it back. 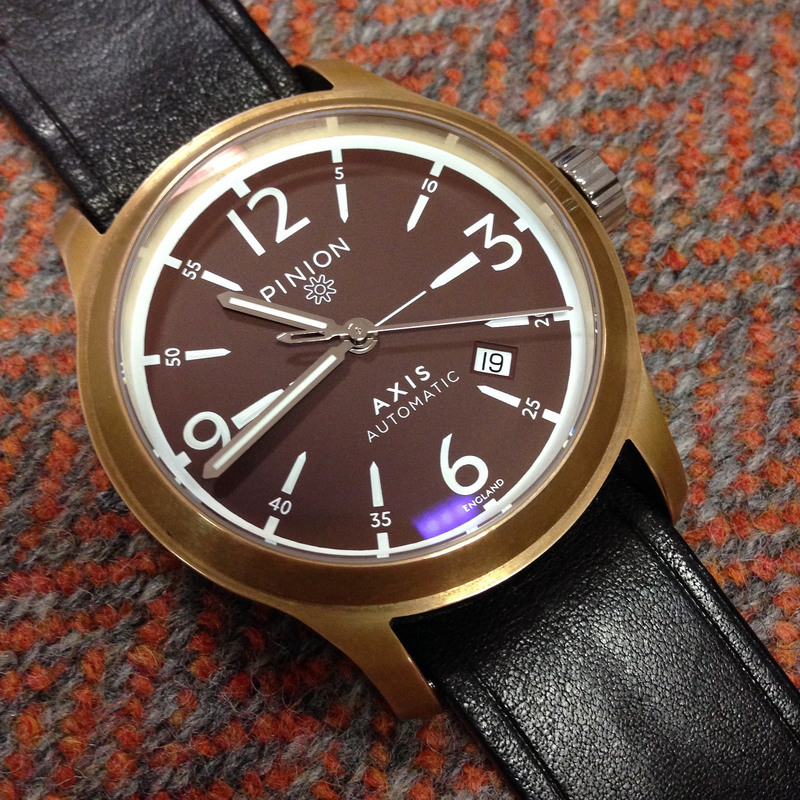 The Pinion Axis Automatic is available from £1,950, the Axis Pure from £2,950 and the Revival 1969 from £4,950. 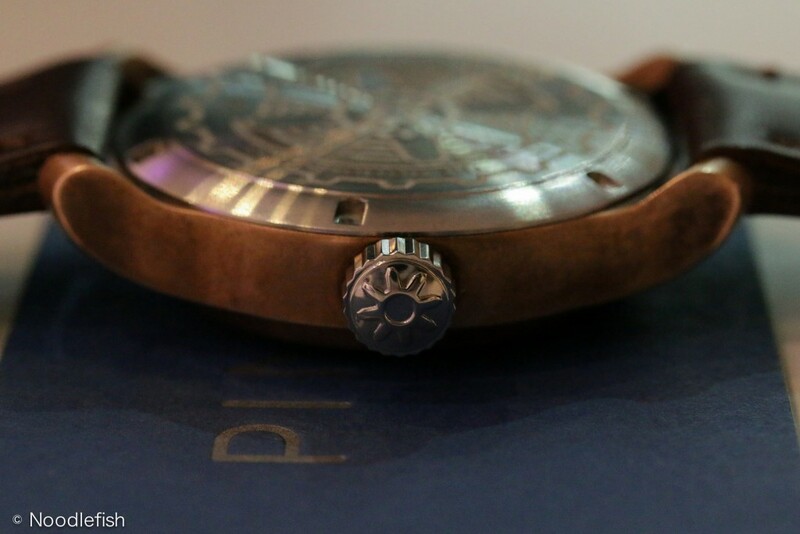 My thanks go to Piers Berry, The Motion Works and all involved with Pinion Watches. **Many of these heads were not made from bronze, but rather brass.